Suggested route to the Belgian cycle network (RAVEL) in Agimont, join the quai A. Bertrand and follow quiet streets to the Relais Mon Bijou (see zoom and detailed route .PDF). 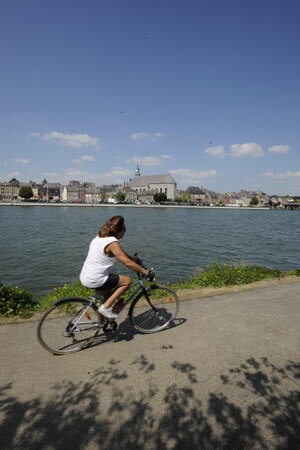 TER Charleville - Givet (along the Meuse River) 8 to 12 trains per day with free bike carriage. Ardennes Travel Pass ticket for €6, valid July and August and Saturdays, Sundays and public holidays. Givet train station. Belgian rail network : Line from Brussels > Namur > Dinant, several trains per day with bike carriage. Dinant train station. - TEC NAMUR-LUXEMBOURG Line 422 Beauraing-Givet-Doische and Line 154a Dinant-Givet. The Belgian N 96 runs to Heer, located 8 km north of Givet in Dinant. Hire (residents only), repair, showers. Enjoy a pleasant stroll along the banks of the Meuse River and the narrow streets of Givet. 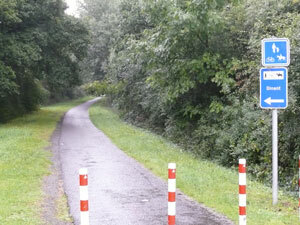 A great stopover on the bike path right next to Belgium. Pedestrian trails and MTB paths. Supervised swimming, organised events (beach volleyball, canoeing and kayaking, etc.). Bar, snacks. Cruises on the Meuse River in season. Boat trips or hire of electric boats. Givet : Market on Friday mornings.